If you watched Hibike! 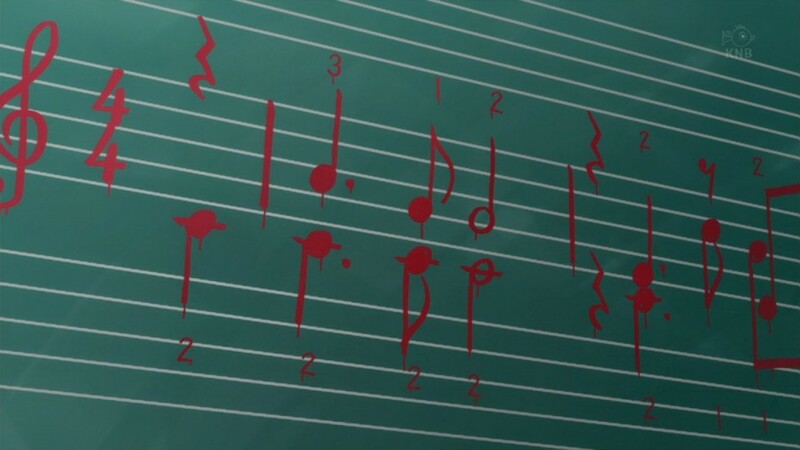 Euphonium, you shouldn’t have to watch this show. Let’s be honest though, even if you haven’t watched Hibike! Euphonium you still shouldn’t be watching this show. I could go on about the problems with this show and why it’s not good like Hibike! Euphonium. If you keep scrolling down you can see just a few of those problems. Already we get a taste of the CG animated budget audience. I am assuming this show had a tight budget, but that’s what happens when the title of your show isn’t Hibike! Euphonium. It is what it is. Are you really going to blame the show for that? I don’t know about you, but I am. 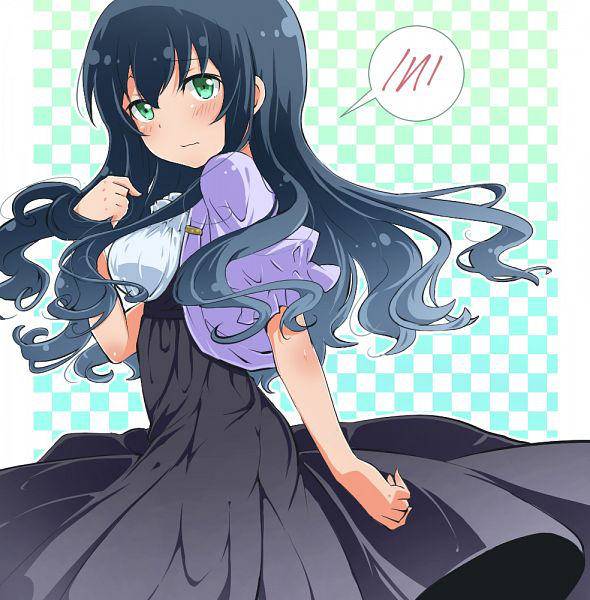 Introducing the main character girl, who is straight. In the opening, the main girl whose name I don’t remember (Saya something? Maybe. 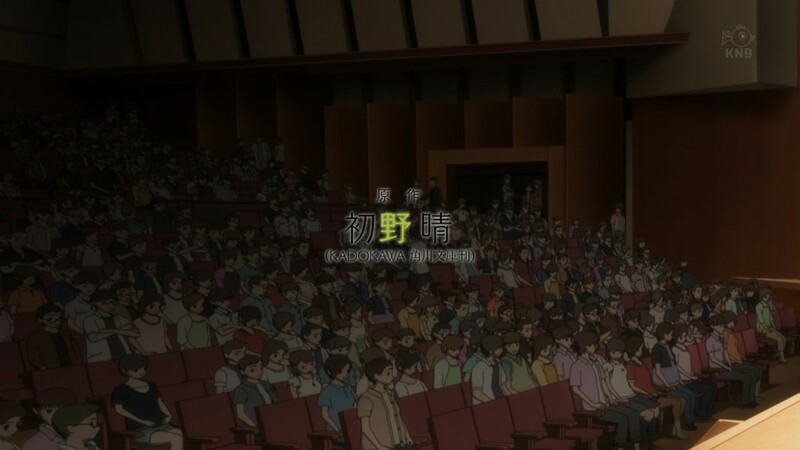 EDITOR NOTE: I just rewatched the episode and saw that her name is Chika, close enough) is introduced. By the way, you will find out by the end of the first episode that she is completely straight. It is very surprising coming from shows like Hibike! Euphonium that don’t force their characters into a specific sexuality (just heavily hints at possibilities, if you know what I mean). But we also have the main character guy, who is not straight. I was going to tagline this show as “It’s like Hibike! Euphonium, but not gay”, until I found out that the main male character above (Haruka? 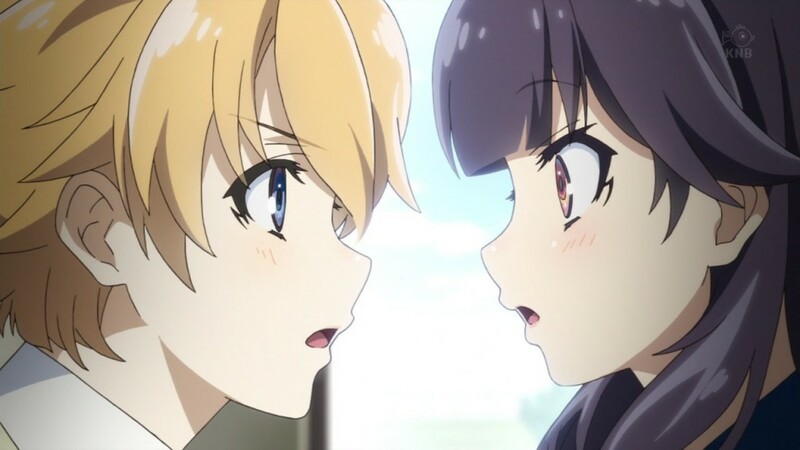 EDITOR NOTE: His name is actually Haruta, and I just realized that the title of the show Haruchika is actually the names of both these characters. Pretty amazing stuff, what will they think of next?) is actually gay. This show definitely does not pull its punches when it comes down to character sexuality. I’m not sure whether to like that or not. All I can say for sure, is that it is a little different from Hibike! Euphonium. 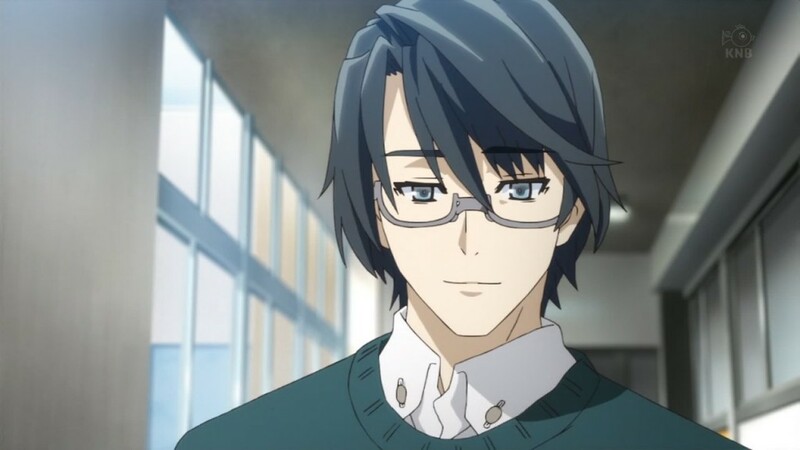 I should mention right now that this person is not a carbon copy of the same character from Hibike! Euphonium. No, definitely not the music advisor/instructor/teacher/coach from Hibike! 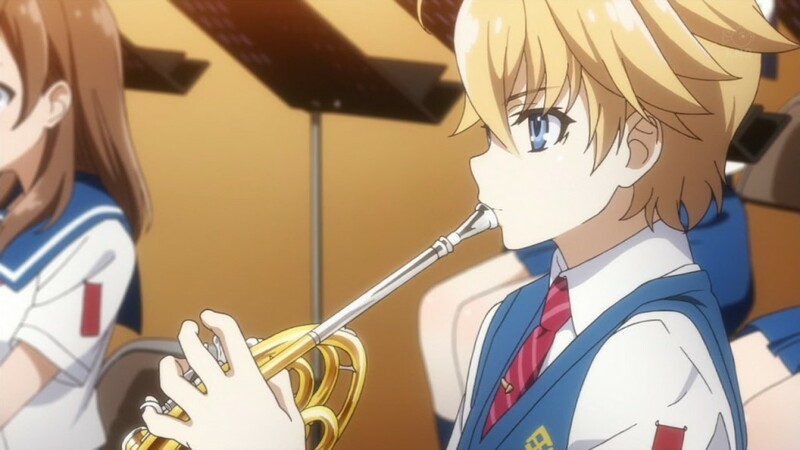 Euphonium which has the same exact character type as this guy. Just because both shows are about students in music clubs does not 100% mean it’s a shameless ripoff, right? I mean there are other things that set this show apart from Hibike! Euphonium, you know? Oh like a boring school mystery to spend the entire episode figuring out (and when I say figure out, I mean wait 8 minutes for the characters to explain it)? I take it back, give me the carbon copy Hibike! Euphonium clone back. I would rather have that than the alternative being boring school mysteries. I slept through enough episodes of Hyouka to know that I don’t need to watch that type of stuff ever again. Good thing the whole music club has 5 students max, the budget isn’t big enough to support any more than that! Let’s talk about the music club instead. Hibike! 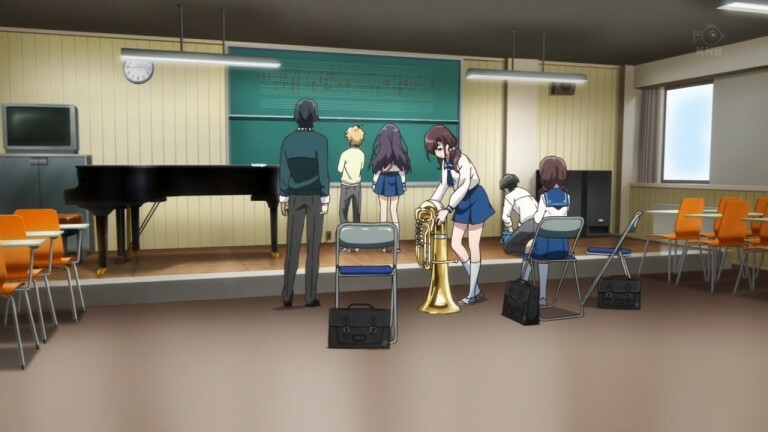 Euphonium had a large number of characters in the music club, but no one really cares about any of them save for a handful. 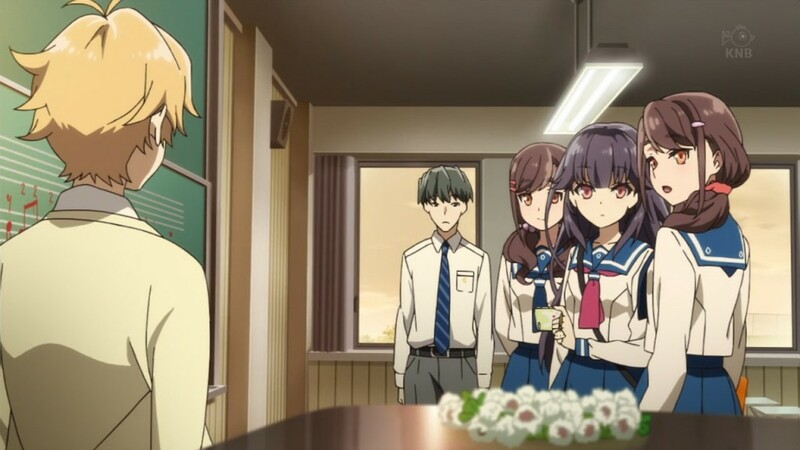 I am glad to see Haruchika kicking all the unnecessary side characters to the curb. 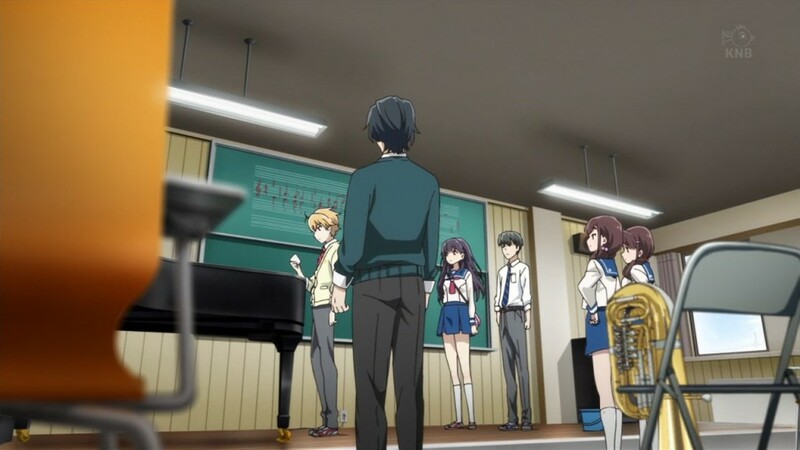 This show completely removes all the useless students from the music club, save for the 5 characters in the main cast. Good on them, the less names I have to remember (or attempt to remember), the better. Oh wait nevermind, the budget ran out so let’s make 2 of them twins. So I guess you could say there’s only 4.5 students in the club. I should mention that I was making jokes about this show being a cheap knock-off of Hibike! Euphonium since minute 1. But this scene with the “twins” sealed the deal. 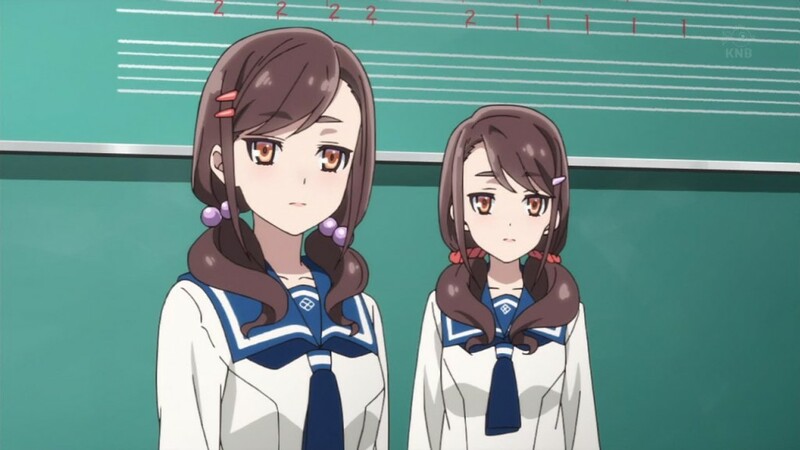 I fell off the edge of my seat laughing and in tears when these two were introduced as twins. Honestly, just look at them. I would have believed it if they said she managed to clone herself. That would have been a even funnier twist. Whatever helps their animation budget, I guess. Wait, so let me get this straight? So you’re telling me that they’re BOTH in love with the music teacher (who by the way is definitely not a copy of the character in Hibike! Euphonium)? Speaking of twists, check out the first unique twist I’ve seen this whole episode. Hold up, hold up, hold the phone. Wait a minute, so let me get this straight. You’re telling me, that not only is Haruta in love with the music teacher, but also Chika? 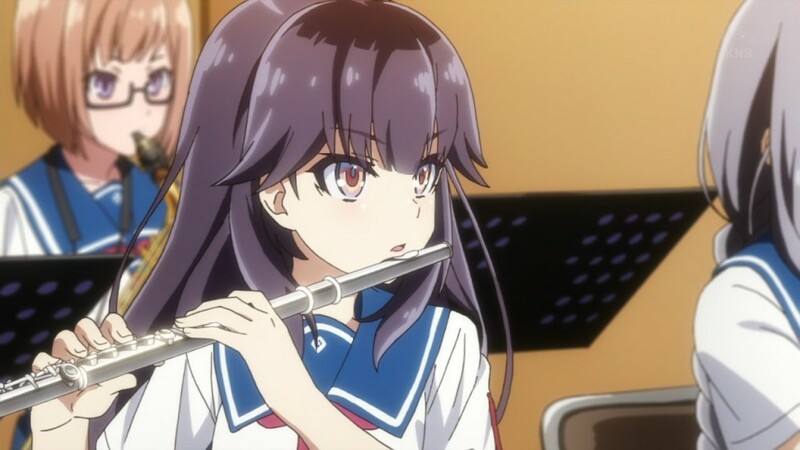 Haruchika (you see what I did there, I combined both their names to form the title of the show) is in love with the music teacher? We’re going to see the wild love antics of these two for at least 10 more episodes? Yeah, you’re going to have to do better than that to get people to watch Episode 2, or the rest of the show really. Not even the dude with the bowl cut wants any part of this. just look at him. Seriously everyone, just go and watch Hibike! Euphonium. If you have already seen Hibike! Euphonium before, then rewatch it again. I am 100% sure it will be more fulfilling than going through this disaster of a show. I should mention though, that I am not getting paid to tell you to watch Hibike! Euphonium. All I’m actually supposed to be telling you is to not watch this show, Haruchika (that’s why I’m not linking to the show). But on a side note, if you haven’t already watched Hibike! Euphonium, what are you waiting for? I already mentioned Hibike! 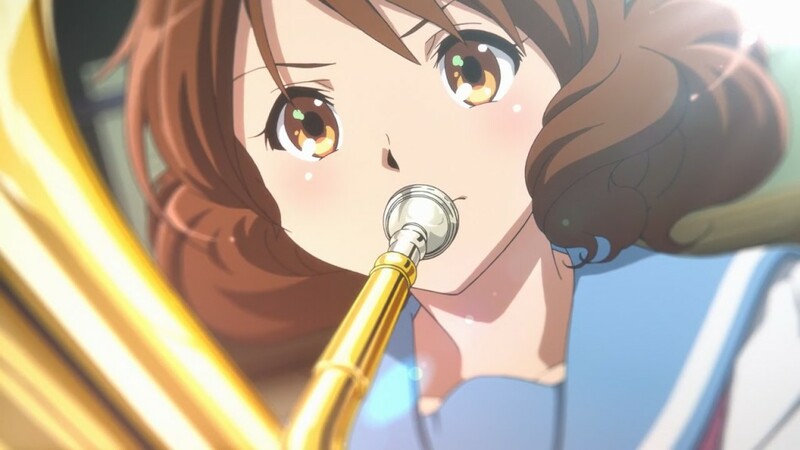 Euphonium at least 10 times in this article, so just go and watch Hibike! Euphonium already, preferably on Crunchyroll.com. 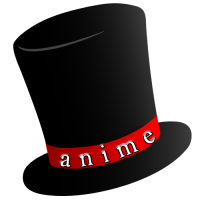 If you don’t have Crunchyroll, you can get started for free. If you’re still reading this, what are you doing? Just go watch Hibike! Euphonium. Could you take a look at my mails?